The first visible signs leading to the transformation of the former Millard Fillmore Gates Circle Hospital into an urban mixed-use community may take hold in the next few weeks. Crews will be remediating portions of the 6.7-acre Gates Circle property, prepping it for a series of developments that, when completed, could top the $100 million mark — 35 percent more than first projected. Fencing and on-site crews will mark a very public view of a multi-phased project that will turn a now-closed hospital site into a complex with a variety of components. "This project is so important for the city," said Dottie Gallagher-Cohen, Buffalo Niagara Partnership president and CEO. A critical first step took place Wednesday when the Erie County Industrial Development Agency's lending arm, the Buffalo and Erie County Regional Development Corp., approved a $2 million loan to the property's developers, Gates Circle Holdings LLC, that will help underwrite the estimated $13 million in remediation costs. The loan is the largest in the RDC's history. "This is a smart loan," said Erie County Executive Mark Poloncarz. Tim Vaeth, TM Montante Group LLC president — and Gates Circle Holding, parent company, said the remediation work must be completed by this fall and certified to secure key Brownfield Tax Credits, which are essential to the project's financial picture. The state Brownfield Tax Credits, under its current rules, are due to expire this year and while Gov. Andrew Cuomo has proposed a new set of brownfield tax credits, there are no guarantees they will be approved and extended by Albany lawmakers. The tax credits can save developers more than 22 percent on certain costs, depending on the project. "Our financial model works right now because it is based on the (brownfield tax credits) program as it exists today," Vaeth said. "What the RDC did was a huge help." Securing the RDC loan was crucial as are other loans from the city's Better Buffalo Fund and New York Power Authority, both of which are expected later this winter and spring. Montante and Canterbury Woods, which is anchoring the project with a senior housing complex, are providing more than $6 million in remediation costs. Work includes removing fuel tanks, contaminated soil and razing a power plant on the property. The Buffalo Preservation Board, on Feb. 5, will review plans to demolish the power plant building. Demolishing the 10-story Millard Fillmore Gates Circle Hospital won't start until this summer and is also subject to city approval. Canterbury Woods hopes to build a six-story, 85,000-square-foot senior housing building where the bulk of the main hospital stands. Work on the Canterbury Woods portion of the project is expected to start this fall and may take two years to complete. Montante will also anchor the property with a 210,000-square-foot building that will house a supermarket and YMCA branch. Residential units are planned where a surface lot is sits at the corner of Lafayette and Linwood avenues. The construction will be phased in over a period of several years, Vaeth said. 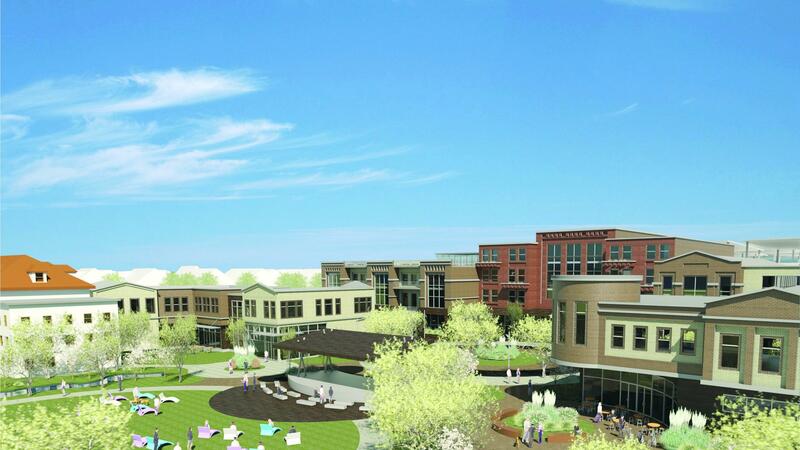 Leaders say seeing the Gates Circle property redeveloped is essential. "I don't want to see another large structure just sitting there, we've seen that before," said Rev. Darius Pridgen, Buffalo Common Council president and Ellicott District Councilman. Kaleida Health closed Millard Fillmore Gates Circle three years ago and shifted all of its functions to the Buffalo Niagara Medical Campus. The Tonawanda-based TM Montante Group was selected in the fall of 2013 as the designated developer for the property, which has been a hospital and health care center for more than one century. Buffalo Mayor Byron Brown said he is impressed with Montante's redevelopment plan and its variety of uses. "It is a huge undertaking," Brown said. "They really sweated the details. This is a 'go' project and a project that is going to get done." The agency directors, Wednesday, also approved a $1 million loan to Boston Valley Terra Cotta that will help the company secure new equipment and working capital. Both the Boston Valley and Gates Circle loans were unanimously approved.